Here is a 50′s Kay N-2 archtop I just bought cheap for my wife and I to have as a cool art deco piece for the living room. It looks like it was never played or strung. I plan to make it into a real player with a little work. These guitars can be cool if you put the effort into them. There are a few issues at first glance. The bridge has been glued on with wood glue. I use my pallet knife to pry it off carefully. I am making sure that it doesn’t resist too much or I’ll have to resort to using some steam to work it loose. Luckily not much glue was used so it popped off easily and clean. 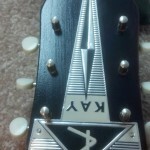 Next I am removing the pickguard and headstock logo. The logo is visibly crooked so I plan to re-align it and attach it more securely. I use some flush cut nippers to pry the little nails out and put the decal aside. What a cool looking Kelvinator logo. That was a big reason I bought it. Amazingly the neck joint and angle are good. 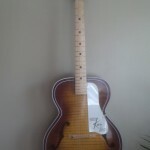 The neck is slightly off side to side, but not enough to justify the trouble of resetting the neck. I’ll just re-align the tailpiece instead to compensate for that later. The frets and fingerboard are rough. 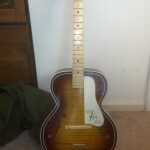 You can see crushed wood around the frets and popped frets everywhere. I’ll refret this one and fix those issues. 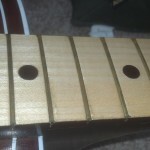 With the old brass frets removed, I can fix the crushed areas around the frets that were installed with too much force. 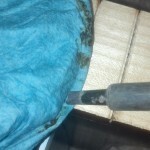 I wet a shop towel and use my soldering iron to steam out the crushed wood fibers. I am able to get them almost completely steamed out and level with the board. 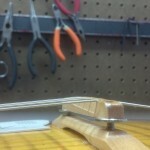 I level the fingerboard until it is perfectly flat with no high or low spots anywhere. This neck is dead straight! It’s going to play like a dream when it gets done. After leveling the fingerboard I sprayed 2 coats of sealer followed by 3 coats of semi gloss lacquer. 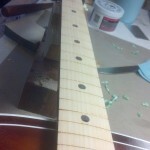 After drying, it’s ready for frets. For the frets I chose a medium sized Mojo fretwire with a crown width of .094” and crown height of .047”. It gives me plenty of meat with lots of life. 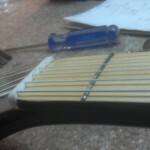 After all the fretwork, these frets are like mirrors and perfectly level. Can’t wait to play this thing now. Time to put everything back together. 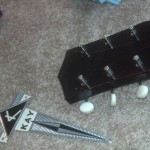 For the headstock logo, I filled the old nail holes and used carpet tape to stick the logo where I want it. The carpet tape keeps the edges down so it won’t get caught on anything and bend it. These old Kay decals are really thin. Once in place, I can drill holes for the nails and tap them in. The bridge posts are loose and need to be reset. 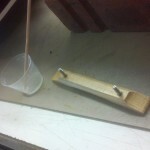 I use Mojotone Tru Glu 5-minute epoxy to set the posts in the wooden base. It fills all the gaps and bonds the metal posts into the wood. They are rock solid now and the bridge is ready for strings. Winding the strings on to get the final setup. Although these machine heads aren’t real smooth, they stay in tune just fine with a couple of wraps and locking the string around itself like this. Can’t slip at all this way. The strings are off center on the fingerboard because the neck was set slightly crooked. Rather than reset the neck, I just need to remove the tailpiece and move it over about 1/16” of an inch. 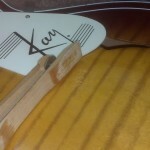 Now the strings are dead center on the fingerboard. 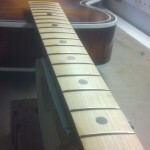 Now I can set the action at the nut using nut slotting files to achieve the correct string height over the first fret. I am setting it lower than I normally would for my own personal preference. I’m extremely light handed so I can stand a fairly low action without any buzzing issues. 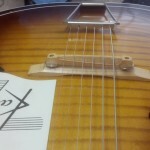 This guitar has a very flat string radius on the bridge as compared to the fingerboard so I need to improve it drastically so the action is even across the fingerboard. 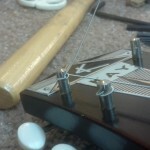 I use my slotted radius gauge to measure the fingerboard radius and adjust the string radius at the bridge using my nut slotting files. After intonation and tuning up the strings, this guitar is ready for it’s hanger on the living room wall. Definitely a cool art piece and killer playing guitar too. Next I’ll install a pickup and turn it into a real jazz monster. That’s another post. Til then….